As a Peace Corps volunteer working in agriculture, I am expected to have a ‘demo plot’, a small tract of land to experiment with crops and green manures (called Abonos Verdes in Spanish) and by which to showcase alternative growing and fertilizing techniques for Paraguayans. Green manures are plants that enrich the soil and sometimes also have secondary benefits like producing food for humans or animals, providing seed for sale, being good for bees, etc. My plot of land is owned by Luciano Benitez (56) and Eligia Esquivel (‘Ellie’, 38; note – it is very common for older men to marry much younger women) and is surrounded by their own field (about 10 hectares or 25 acres), which they work daily. Like most in my community, they are subsistence farmers, meaning they exist primarily by growing most of their own food and do not have regular ‘jobs’ or income. Any income they generate may come from the occasional sale of firewood, cheese, or excess mandioca if they have it. This family is poor but fairly progressive in their interest to try new things. Their livelihood depends on the weather, hard work, and their expertise in knowing their land and crops. I frequently see one or both of them while working my own land and sometimes they are accompanied by some of their children: Vicente (16), Lucia (11), or Luz Maria (6). In the summer, Luciano often arrives at the field at 5am and works until 10am before the heat of the day. His wife wakes about 5am to prepare and enjoy her mate then brings a breakfast of deep fried tortillas and mandioca at 8am. Sometimes she stays and works with him for a time, other times she returns home to start preparing lunch. Every other morning she also charges her biodigester with a bucket of fresh cow manure and water. A biodigester is a long plastic tube about two feet in diameter that sits in a hollow in the ground and decomposes organic matter (in PY this is usually cow or pig manure). 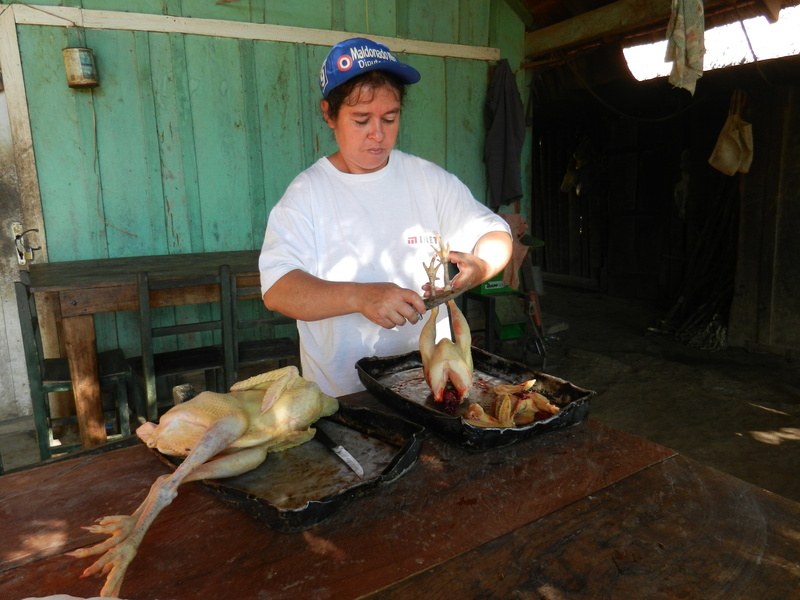 The methane gas produced by the biodigester provides several hours of free fuel for some of her cooking needs. Both husband and wife are incredibly guapo (normally guapo means handsome in Spanish but in PY it means ‘hardworking’) and generous beyond measure. Luciano is respectful, patient in answering my questions and interested in teaching me what he knows. Ellie and I frequently exchange recipes and are brainstorming project ideas for the Women’s Club I hope to start soon. After lunch and a mid-day siesta to avoid the heat of the day, he will return to the field for most of the afternoon. Many times they bring the horse and cart when harvesting larger amounts of sugar cane, mandioca or corn. 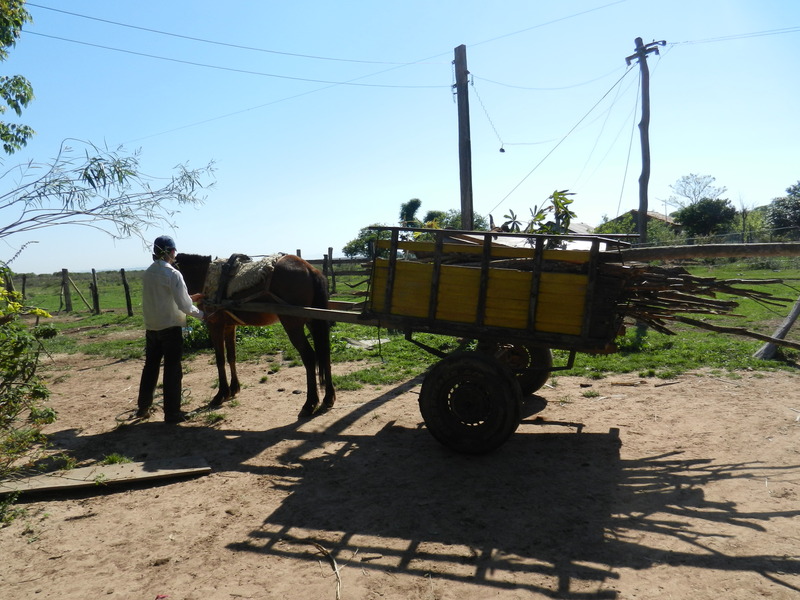 Vicente, 16, returning to the farm with the horse and cart full of mandioca and sugar cane. Ellie is also an avid terere drinker, stopping to refresh with this popular Paraguayan tea (also used for medicinal purposes with the right herbs) several times throughout the day. In late afternoon, Ellie goes to their other field (also known as a kokue) to harvest sugar cane to feed the cows at night. She brought me with her the other day for my first-ever sugar cane harvesting experience. I was inappropriately dressed for mosquito and snake habitat in a skirt and flip flops, thinking we were just going to visit on her patio. This can be back-breaking work as each stalk of cane must be cut with a machete, then tied and put in a wheelbarrow and carted 1/4 mile back home; some of the canes are 12′ tall! However, back at the house she taught me to make ‘mosto’, a sugar-water-juice made from crushing sugar cane in a grinder. At the end of my visit she sent me packing with an armload of peaches, eggs, and a bottle of mosto. 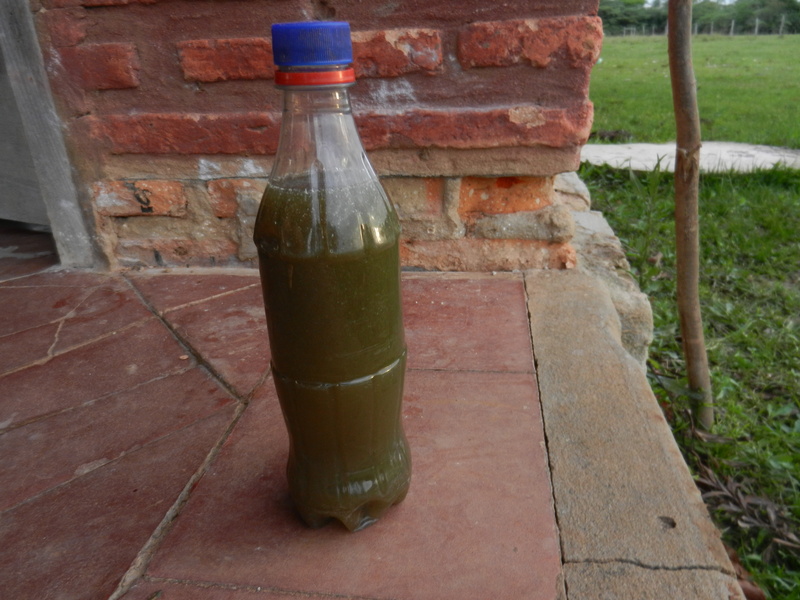 Bottle of mosto, a sugar-water drink made from crushed sugar cane. VERY sweet! Luciano and Ellie were married and moved to our town in 1996 where Luciano’s family has lived since the town originally formed in the mid-1800s. She is one of nine children (with two sets of twins, including herself). He is one of six. His sisters live next door and his mom and youngest brother are across the street (note- it is customary and honorable for at least one grown child to live at home and take care of the mother; often it’s an unmarried son but sometimes a married daughter and her husband will be the caregivers; a man is needed to grow crops for food and animals). Two years later they built their own place and started a family. When not in high school in the next pueblo, Vicente helps his father in the fields or with the animals. Both girls attend primary school here in my compania during the afternoon session (school here consists only of half-days, either 7-11am or 1-5pm). The family recently invited me to lunch for Lucia’s 11th birthday and asked me to come early so I could learn how to make tallarine con pollo (spaghetti with chicken). I arrived around 9am with a container of my mandio chyryry for them to try and a pile of carrots for the spaghetti sauce. Ellie had just killed two chickens for the occasion and cut them up while I prepared vegetables. These were cooked over an open fire on the ground in the ‘kitchen’, which is just a wooden shed. She also made delicious sopa paraguaya (like cornbread) in her new electric oven located in the bedroom. And, yes, all of this took over four hours. Birthdays are not a grand celebration here unless it is a girl’s quincinera, or 15th birthday…then it’s like a wedding. This day, there was no cake and only one gift brought by two visiting relatives. This is normal. All through the morning I observed piglets running between the patio and backyard, a day-old foal sticking close to its mother’s side, kids sulking when asked to help, birds flitting amongst the fruit trees beside the house, chickens greedily scooping up scraps of vegetables during lunch preparations and dogs dutily watching for anyone or anything that didn’t belong. When Ellie was busy working the fire in the shed, the youngest pulled out her guarani schoolbook and read to me (this was excellent practice for me too!) 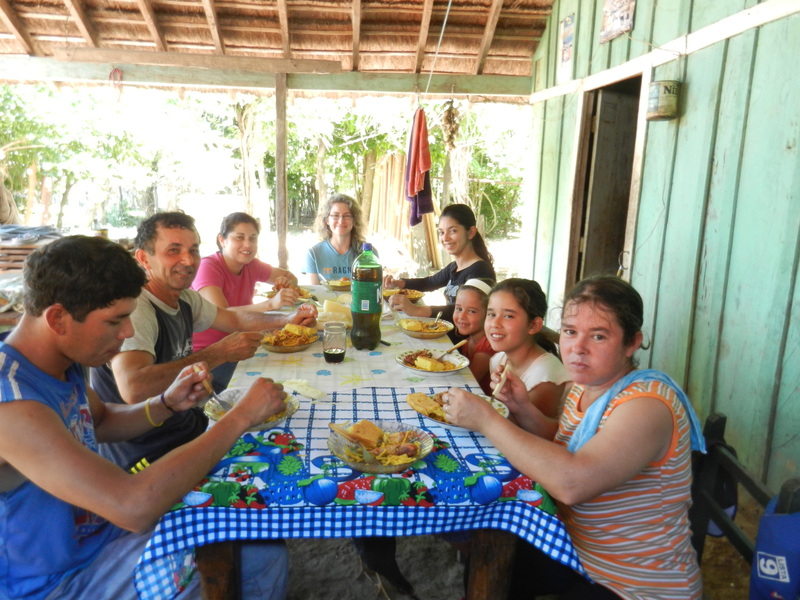 While this family speaks primarily guarani (and super fast! ), they do understand Spanish and will sometimes use a Spanish word to explain for me when I don’t understand. Each time I visit, I can see my language improve and, in turn, the family becomes more comfortable in my presence (you can’t imagine the awkwardness that happens when you try and fail repeatedly to have conversation and can’t understand each other). Luciano keeps it light by ALWAYS asking for an update on my relationship status and, because the answer is always ‘no, I do not have a boyfriend’, he questions why and pleads for me to get myself a man. While many Paraguayans don’t understand how a woman can be happy without a man in her life, since deciding to ‘go with’ the joking instead of being defensive or avoiding the topic, it makes for good conversation and lots of joking around. I’m grateful for this family and their willingness to share their land, their lives and their sense of humor with me.